Golden Age Pre73 Mk3 Plus Mic Preamp with Carnhill Transformers. The MKIII PLUS has the following new features compared to the MKII. Tantalum capacitors in the signal path. Selectable two frequency high pass filter, 6 dB/octave at 40 or 170Hz. The pcb is prepared for the Carnhill input transformer. Revised and less complicated GAIN switch with a separate switch for MIC/LINE selection. All GAIN settings can also be used in LINE mode. The PRE-73 MKIII PLUS is a one-channel vintage style microphone-, lineand instrument preamplifier. The signal path uses only discrete components like resistors, capacitors and transistors. The inand output is transformer balanced, using two different transformers, each one optimized for its purpose. This is the way audio components were built before integrated circuits became available. The circuit used in the PRE-73 MKIII is similar to the preamp section in the classical 1073 module with a corresponding sound character that is warm, punchy, sweet and musical. These classic characteristics have been heard on countless recordings through the years and it is a versatile sound that works very well on most sound sources and in most genres. The essence of this sound is now available at a surprisingly low cost, making it available to nearly everyone. No intergrated circuits in the signal path. Maximum gain in MIC mode is 80 dB, enough to handle passive ribbon mics with quiet sound sources. GAIN switch range 20 -80 dB. GAIN/LINE mode switch, gain is reduced by 30 dB in LINE mode. Selectable 6 dB/octave two frequency high pass filter at around 40 (HP1) and 170 Hz (HP2). Switchable impedance in MIC mode, 1200 or 300 Ohms, will change the tone of most mics. The input impedance in LINE mode is 10 kohm. Switchable phantom power and absolute phase. A high-impedance instrument input for any sound module, electric guitar or bass. A simple but effective 4-step LED output level meter. The output level control makes it possible to make fine gain adjustments and also to overload the main gain stage(s) for more character and then lower the signal to a suitable level before the output stage. Combo XLR/TRS input jack and separate output XLR and TRS jacks for flexible connections. Insert jack for inserting EQ´s and other units. Selectable 600 ohm output termination. External power supply to avoid interaction with the audio circuits and transformers. A solid build quality that will last many years of normal use. These charges are the buyers responsibility. 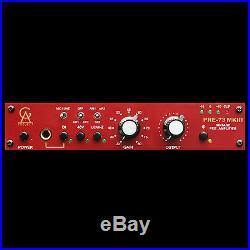 The item "Golden Age Pre73 Mk3 Plus Mic Preamp with Carnhill Transformers" is in sale since Monday, June 01, 2015. This item is in the category "Musical Instruments & Gear\Pro Audio Equipment\Preamps & Channel Strips". The seller is "altomusicpro" and is located in Middletown, New York. This item can be shipped to United States, to Canada, to United Kingdom, DK, RO, SK, BG, CZ, FI, HU, LV, LT, MT, EE, to Australia, GR, PT, CY, SI, to Japan, to China, SE, KR, ID, to Taiwan, ZA, TH, to Belgium, to France, to Hong Kong, to Ireland, to Netherlands, PL, to Spain, to Italy, to Germany, to Austria, RU, IL, to Mexico, to New Zealand, PH, SG, to Switzerland, NO, SA, UA, AE, QA, KW, BH, HR, MY, BR, CL, CO, CR, PA, TT.